How many timeslots in GSM are allocated for control channel per cell? Hi, I am very new here and just getting the hang of cellular networking. My question is, in varsity, we learnt that every cell in GSM is allocated with some frequencies, or carriers. Each frequency carrier is divided in eight time slots. These time slots are what we call channels, or physical channels. Now, of these eight time slots per frequency, some are used only to send voice or speech bits and some other are `used to send control bits. These are called traffic channel and control channel respectively. I guess my question is, How many of these time slots are allocated for traffic channel and how many are for control channel? 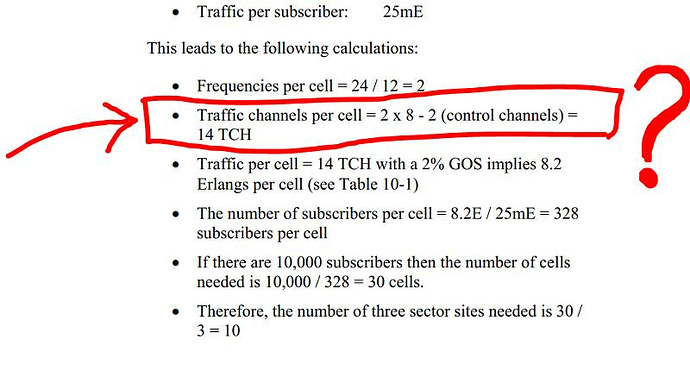 From an excerpt of a cell planning guide by Ericsson I found online, it says if there are two frequencies in a cell, there will be 14 traffic channels in a cell (2*8-2). So, there are seven traffic time slots (at TS 1-7) and one control time slots (at TS0) within eight time slots of a single carrier, right? But from this GSM frame visualization site, it says the first two time slots are used for control channels and the rest six are for traffic channels. So that is my question. Of the eight time slots per a single frequency carrier, how many are used for control channels? Is it one? Or is it two?